This 3-part series is for all pregnant people, as well as birth workers with vaginas. It’s time to get connected to the part of your body through which your baby is born. So many of us are disconnected, misinformed and confused about how our vaginas work and how we can work with them. In this safe, confidential, supportive environment, you’ll have an opportunity to take an inward journey (fully clothed) to expand your capacity to open more easily for your baby, your pleasure and your power. We’ll illuminate and begin to release any shame, suffering, negative beliefs, traumas and unconscious physiological patterns that could make it difficult for us to open and accept the intensity of birth. With lots of humor, compassion, and levity, we’ll practice simple yoga poses, focused breathing, visualization, sound, fun exercises in class and at home. This is an invitation to get real and vulnerable with yourself, and the people in the room, with the intention of having a more empowered and enlightened experience of birth. This workshop offers couples an opportunity to go deeper in their connection to each other, their babies and their own intuitive wisdom. Together you’ll learn how to confidently navigate all phases of labor with breath awareness, massage and partner poses. Furthermore, partners will learn skills for self care and creating a safe and calm environment for the birthing mother. Learn to focus your mind, settle your nervous system and release your body to make your birth easier, faster and more intuitive. With Restorative Yoga poses and HypnoBirthing breathing and visualization, you’ll surrender into deep relaxation, increasing your comfort throughout pregnancy, birth and postpartum. 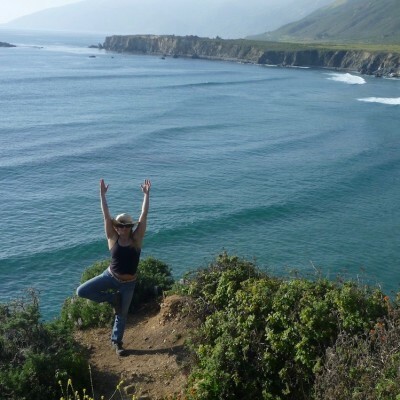 To learn more about Britt’s yoga practice, as well as classes, workshops and retreats she offers, visit Britt Fohrman Yoga. Come explore what it means to deeply rest in your own body and mind through Restorative Yoga and Zen. Restorative Yoga gives us an opportunity to balance the effort in our lives with ease and surrender. Our retreat will also include dharma offerings, seated meditation, leisure time, gentle movement and stretching to complement our theme of cultivating ease, relaxation and surrender in all aspects of our lives. Registration opens in February 2018, and advance planning is highly recommended as this retreat sells out early in the year. Join me for my SECOND ANNUAL hedonistic, restorative and inspiring weekend focused on deepening your sense of juicy and joyful embodiment. Join an intimate group of wild and wonderful women for a long weekend adventure into your juiciest self. Nestled in the heart of Sierra gold country, the South Yuba River is a gentle and magical river, that wanders over sensuously soft, curved rocks. The water is the perfect temperature in the late summer, warm enough to play, explore and float in all day long, but cool enough to be refreshing. Mamma Yuba offers an abundance of shallow pools to chill and read in, canyons to rock scramble through, cliffs to leap from or low key rapids for body surfing. It’s like a sleepover party for grown up women who like to relax, eat well, do a little yoga, enjoy the outdoors, play (naked?) in the river, connect with their inner wild woman and possibly partake in a little cannabis (totally optional). We’ll be staying on private land just outside of Nevada City, minutes from some of my favorite swimming holes. As we lounge by the river, I will be taking photos of those who want to be photographed, so you’ll go home with a little reminder of what a gorgeous goddess you truly are. Check out my Instagram feed to see some pics of the lovely ladies I have previously enjoyed the river with over the past 4 summers. Local, organic cannabis products will be mindfully curated by yours truly, chosen to enhance your sensuality, embodiment, relaxation and pleasure on all levels. We will be joined by my sweet friend Season Bender, who’s an incredible chef, focused on organic, seasonal, nourishing and delightfully delicious meals. I have enjoyed her culinary magic on other retreats and am thrilled that she will be coming up from LA to join us! Everything will be gluten free and all dietary restrictions will be honored. The accommodation options include solo and shared bedrooms, sofa beds in the common space and camping (with an easily accessible bathhouse with hot showers just for the campers), something for every budget. The EARLY BIRD cost is $885-1440 for the 5 day, 4 night weekend (depending on which accommodations you choose). The cost will include morning yoga, all meals, cannabis, photography, activities, access to a completely private river spot and a goodie bag. I will help to organize carpooling. Depending on traffic, Nevada City is about 2.5-3.5 hours from SF. We will arrive on Thursday around 2pm and will depart around 11am on Monday. A. NICE. LONG. WEEKEND. Everything is included, except massages, which will be offered by Carolyn Cohen, internationally renown yoga teacher and Thai Massage therapist. Since there is only space for 12 lucky ladies, reserve your spot early! Registration opens on March 27, 2019. Email me to put your name on the waiting list or to get more info. Once registration is open, a non-refundable $350 deposit is required to hold your spot. EARLY BIRD rates expire May 10, after that the cost goes up $100 per person. INTERESTED IN BOOKING A PRIVATE RETREAT? Private retreats are a great way to gather friends, colleagues or family to practice yoga together, build community and strengthen connections. I offer customized adventures all around the world that can include surfing, hiking, camping, meditation, healthy living mentoring, exploring local culture and so much more. Your private retreat can take place anywhere from the Northern California coast to Lake Tahoe, Costa Rica or Hawaii—or wherever you desire! Please inquire with me directly about pricing as costs vary depending on the size of your group, amount of yoga instruction, and the location that you choose.